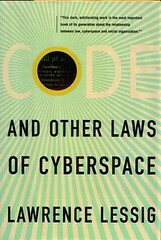 Lawrence Lessig’s Code and Other Laws of Cyberspace turns 10 this year and the folks over at Cato Unbound have put together an online debate about the book and its impact on cyberlaw, which I am honored to be taking part in. The discussion begins today with a lead essay from Declan McCullagh of CNet News and then continues throughout the week with responses from Harvard’s Jonathan Zittrain, myself, and then Prof. Lessig himself. One response might be that the right philosopher-kings have not yet been elevated to the right thrones. But assuming perfection on the part of political systems (especially when sketching plans to expand their influence) is less than compelling. The field of public choice theory has described many forms of government failure, and there’s no obvious reason to exempt Internet regulation from its insights about rent-seeking and regulatory capture. Sounds like it could be a heated discussion! Jonathan Zittrain is up next with an essay due to be posted on Wednesday and then my response will follow on Friday. Prof. Lessig’s response will go up a week from today. I look forward to this exchange and the responses it generates. I encourage readers to head over to the Cato Unbound site and check out the essays as they appear. I’ll post reminders here as the installments go live on the Cato site.